Zaira Wasim (born 23 October 2000) is an Indian actress of Kashmiri family who works in Hindi films. The recipient of numerous accolades, including a Filmfare Award and a National Film Award, Wasim was honoured with National Child Award for Exceptional Achievement by Ram Nath Kovind, the President of India, at a ceremony in New Delhi in 2017. After acting in two television commercials, Wasim began her film career with the sports biopic Dangal (2016), portraying the young role of Indian sportswoman Geeta Phogat, and followed it by starring as a headstrong aspiring singer in the musical drama Secret Superstar (2017), both of which rank among the highest-grossing Indian films of all time. Her acclaimed performances in both the films won her several awards including the National Film Award for Best Supporting Actress for the former and the Filmfare Critics Award for Best Actress for the latter. Zaira Wasim was born in Kashmir, India to Zahid and Zarqa Wasim. Her father works as an Executive Manager in Srinagar and her mother is a teacher. She completed tenth grade from St. Paul's International Academy in Sonwar Bagh, Srinagar for which she scored 92 per cent in her Board examinations. She is presently a 12th grade student in the Humanities stream in Jammu’s Heritage School under Central Board of Secondary Education. After appearing in two television commercials, Wasim made her film debut with Nitesh Tiwari's sports biopic Dangal (2016). It tella the story of Mahavir Singh Phogat (played by Khan), a pehlwani amateur wrestler, who trains his daughters Geeta Phogat (played by Wasim) and Babita Kumari (played by Suhani Bhatnagar) to become India's top female wrestlers. With grossings of ₹2125.3 crore (US$330 million) in box office against a budget of ₹70 crore (US$9.7 million), Dangal emerged as the highest-grossing Bollywood film of 2016 and one of the highest-grossing Indian films of all time. For her performance in the film, Wasim won the National Film Award for Best Supporting Actress and garnered a nomination for the Filmfare Award for Best Female Debut. Wasim next collaborted with Aamir Khan for the second time (alongside Meher Vij) in Advait Chandan's directorial debut, the musical drama Secret Superstar (2017). The film revolves around the story of an aspiring singer named Insia Malik (played by Wasim). The film grossed ₹977 crore (US$154 million) against a budget of ₹15 crore, and proved to be one of Hindi cinema's top-grossing female-led films. It also emerged as the highest-grossing Bollywood film of 2017 like Dangal. For her performance, Wasim won the Filmfare Critics Award for Best Actress and also received a Best Actress nomination at the ceremony. She was also honoured with the National Child Award for Exceptional Achievement by Ram Nath Kovind, the President of India, at New Delhi, in 2017. As of March 2019, Wasim has completed filming for her next project, the biopic The Sky Is Pink, about the story of a motivational speaker named Aisha Chaudhary who died at the age of 18 due to pulmonary fibrosis. Co-starring Priyanka Chopra and Farhan Akhtar, the film is directed by Shonali Bose and is set to release on 11 October 2019. 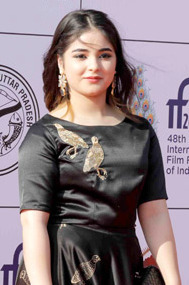 In 2016, publicity photos of Zaira Wasim surfaced showing her with trimmed hair for her role in the film Dangal. This resulted in her being trolled online by radical Muslims for having been "un-islamic" by acting in a film. In January 2017, a local news organization published the news and photos of her meeting with Chief Minister Mehbooba Mufti. This resulted in further criticism and Wasim receiving death threats because Mufti had described Wasim as a "Kashmiri role model". In response, Zaira issued an apology on her Facebook and Instagram account which she deleted shortly after. But not before, the message was picked up and publicized by news media which added further fuel to the controversy. Subsequently, several Indian celebrities have voiced their support for Wasim, denouncing her critics. In January 2017, the Indian sports minister Vijay Goel during a visit to an art gallery tweeted a message "Our daughters are breaking out of their cages and moving forward". This was accompanied by a photo of him standing before a painting depicting two women – one in a hijab and another cowering in a cage. Zaira responded to Goel requesting him not to connect her to "such a discourteous depiction" and that women in hijab were "beautiful and free". Goel responded saying that she had misinterpreted his tweet, he appreciated Wasim’s work and meant to discourage "evil and patriarchal notions". In December 2017, Wasim alleged that she had been harassed mid-air on an Air Vistara flight UK981 between Delhi and Mumbai. She posted a series of messages on her Instagram profile alleging that a man sitting behind her on the flight had caressed her neck while she was asleep. She also wrote that she had tried to record what the man was doing, but failed due to dim lights. The airline issued an apology on the issue and released a statement saying that a detailed investigation would be conducted. The accused, Vikas Sachdeva of Chandivli in Mumbai was subsequently arrested and charged under Protection of Children from Sexual Offences Act (POCSO) given Wasim was a legal minor. The accused's wife claimed her husband had been resting when his leg accidentally touched Wasim. And that he had apologized before getting off the plane at the Mumbai airport, which the actress had acknowledged. The suspect has been placed in judicial custody pending a court hearing. There has been support for the accused in the form of a signature-campaign by his neighbours and on social pages with pages like ‘Justice for Vikas Sachdeva’. Wasim subsequently became a target of internet trolling, which has been criticized by the Mumbai Police, stating in a tweet, "It is the Constitutional Right of every victim to report sexual abuse and it is our duty to take cognizance, investigate & facilitate justice. Kindly refrain from being judgmental and #Respect the Right of a Victim of a Sexual Assault". In a statement included with the tweet, the Mumbai Police also stated, "Our action against the accused is backed by sufficient evidence against him and it has been under the scrutiny by the court of law." ^ Limited, InLinks Communication Private. "Zaira Wasim awarded the National Child Award for Exceptional Achievement 2017 - Jammu Links News". www.jammulinksnews.com. Retrieved 25 February 2018. ^ a b "Secret Superstar actor Zaira Wasim receives exceptional achievement award from President Kovind". Hindustan Times. 16 November 2018. ^ "Kiran Rao thanks Kashmir school for backing 'Dangal' actress". ^ "'I wish my parents would praise me but they don't'". ^ "Dangal girl Zaira Wasim on growing up in Kashmir: Teenagers there have a view on everything". The Indian Express. 9 February 2017. Retrieved 4 August 2017. ^ "Secret Superstar actor Zaira Wasim: A girl with a new song". ^ "'Islamic State will kill you': Masked men threaten Dangal actress Zaira Wasim in Srinagar | Latest News & Updates at Daily News & Analysis". dna. 20 January 2017. Retrieved 25 October 2017. ^ "'Dangal' Girl Zaira Wasim Deletes Controversial Open Letter". The Quint. Retrieved 25 October 2017. ^ "Zaira Wasim: Bollywood celebs come out in support of Dangal girl". hindustantimes.com/. 17 January 2017. Retrieved 18 October 2017. ^ "Dangal star Zaira Wasim spars with sports min Vijay Goel for his hijab tweet". hindustantimes.com. 20 January 2017. Retrieved 18 October 2017. ^ "Dangal actress Zaira Wasim alleges molestation onboard Vistara flight". The Economic Times. 10 December 2017. Retrieved 18 December 2017. ^ "Zaira Wasim molestation row: Accused's judicial custody extended to December 22". The Economic Times. 13 December 2017. Retrieved 18 December 2017. ^ "support pours in for molestation accused". The Hindu. ^ "Mumbai Police Dismiss Trolls And Stand With Zaira Wasim With This Supportive Tweet". India Times. 20 December 2017. ^ "Minor actor molestation case: Mumbai Police says sufficient evidence against accused, requests restraint in discussions". Daily News and Analysis. 16 December 2017. ^ "64th National Film Awards" (PDF) (Press release). Directorate of Film Festivals. Retrieved 4 August 2017. ^ "64th National Film Awards: Zaira Wasim wins Best Supporting Actress for Dangal". Retrieved 11 October 2017. ^ "Nominations for the 63rd Jio Filmfare Awards 2018". filmfare.com. Retrieved 18 January 2018. ^ "Critics Best Actor in Leading Role Female 2017 Nominees | Filmfare Awards". filmfare.com. Retrieved 20 January 2018. ^ "Zaira Wasim - Most Promising Newcomer". Twitter. ^ "Star Screen Awards 2018". Hotstar. ^ "2018 Archives - Zee Cine Awards". Zee Cine Awards. Retrieved 31 December 2017. ^ "Kumari Zaira Wasim: Awarded the NationalChildAwards for Exceptional Achievement 2017". Twitter. ^ "Movie Awards 2017: News18 Movie Awards 2017 Nominees, Latest New". News18. Retrieved 4 December 2017. ^ "Reel Movie On Screen Awards 2018 | Best Film, Actor, Actress, Director and More". News18. Retrieved 27 February 2018. ^ Reporter (31 July 2017). "Winners of Big Zee Entertainment Awards 2017". Total Reporter. Retrieved 11 October 2017. ^ "Lux Golden Rose Awards - Zaira Wasim". Twitter. ^ "Lux Golden Rose Awards". The Indian Express. ^ "IIFA Awards 2018 Winners". IIFA. ^ "Indian Film Festival Melbourne". www.iffm.com.au. Retrieved 13 July 2018. This page was last edited on 20 April 2019, at 16:49 (UTC).